More than ever, Royal Caribbean passengers are looking to stay active while on their cruise vacation and Royal Caribbean's fitness centers are more than just an after thought. These gyms feature the latest equipment and programs to keep you lean and fit while at sea. Let's take a closer look at what Royal Caribbean offers and how you can take advantage of what's available. The heart of Royal Caribbean's fitness offerings are the gyms found onboard their cruise ships. Each gym offers passengers cardio and weight machines to get your heart pumping and muscles moving. These self-paced machines are what you will typically find at your gym back home. The machines in the gym include treadmills, ellipticals, bench presses, free weights and more. 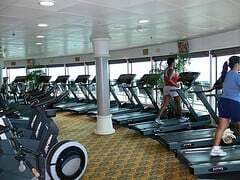 The amount and variety of machines vary from ship to ship, with the Freedom and Oasis class gyms offering the biggest gyms in terms of square footage and machines. On Oasis of the Seas, there's over 150 cardio machines. Some ships also include other fitness options, such as a boxing ring on Freedom class ships. There is also areas in the fitness center to stretch or do yoga on your own. Other machines like spin bikes are available to use provided they are not needed for a scheduled class. The machines and free weights at the fitness center are free and open to all passengers. There is a posted age restriction requiring everyone in the gym be at least 16 years old. Royal Caribbean offers on each of its cruise ships different exercise classes that you may join for a small fee. These classes vary from ship to ship and sailing to sailing, but generally you can expect to find spin, yoga, and Pilates classes, as well as the services of a personal trainer. Generally speaking, many of the exercise classes offered are usually held in the early morning hours but you can get a good idea of what will be offered and sign up for classes on the first day of your cruise. A visit to the gym can get you a free tour as well as access to the schedule of classes. You can sign up for classes a la carte or sometimes opt into a package deal to save a few dollars by booking multiple classes at once. The classes offered unless otherwise indicated, are geared to passengers of all levels. Guests with heart or other health conditions should check with their physician first. You must be at least 18 years of age. Staying fit on your Royal Caribbean cruise is not limited to being indoors. 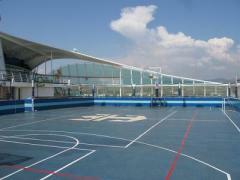 Each cruise ship also has a sports deck to allow for outdoor exercise as well. The jogging track is often a favorite for runners to get a few laps of running in and has a path for joggers and walkers. There's also an indication on the track how many laps equals one mile. Use of the track is free and open at all times. Oasis class ships feature the the largest jogging track at sea that is partly covered to protect from the elements. Each Royal Caribbean ship also has a number of outdoor activities to enjoy, including rock climbing, basketball, volleyball, and more. Much of the activities on the sports deck are free if you do it on your own and organized games can be found throughout the cruise for team-based fun. Royal Caribbean has been offering a 5k race twice, with the next Royal 5k being offered on Allure of the Seas when the ship is docked in St. Maarten. For $25, passengers can take part in the race along with private meet-and-greet sessions with high-profile racing athletes, seminars and lectures with high-profile athletes, personal training tips from experts, and speed tests onboard the track on your ship. Speaking of running, Royal Caribbean has even started its own running team called "Royal Caribbean Runners" and is mostly geared towards residents of the United Kingdom who want to combine their passion for running with cruising on Royal Caribbean.